We know architects love great design, smart solutions and interesting products. And who doesn’t love gadgets and gizmos? If you’re looking for gifts for architects or you fancy something fun that will make your life that little bit easier, we’ve taken a look at some of the best new products out there. The Bendi Board Light Up Waterproof Keyboard takes all of the things that you hate about keyboards and throws them out of the window. 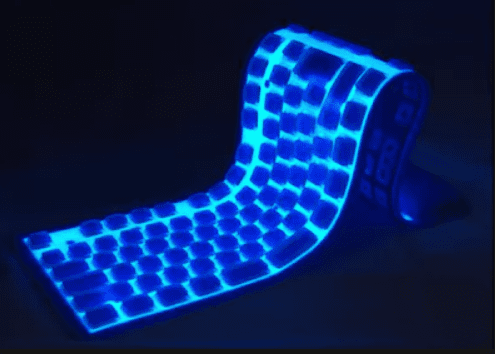 This flexible keyboard can be rolled up and taken with you, it lights up so you can type in the dark and it’s waterproof, so you can spill coffee all over it! Perfect for busy architects who are on the go, this smart keyboard is great for using with a tablet. You may have heard of the 3Doodler – the world’s first 3D printing pen which allows you to draw in 3D and create intricate models out of plastic. This new and improved version is 70% smaller and 50% lighter than the original but still features the same genius technology. This is a fun and unique take on 3D printing, with fast results and a range of coloured plastics to choose from. Unlike a traditional 3D printer, no software knowledge or technical knowledge is required – you simply draw what you want to create. Perfect for creating quick models, this is both great fun and incredibly useful. Fed up with your coffee not being quite hot enough? Or your can of lemonade not quite cold enough? Then you need a USB coaster that either warms or cools your drink. This simple white device can be plugged into your USB port to give you the perfect temperature drink, with the flick of the hot or cold switch. Only using 3.5W of power with a compact, portable design, this little gadget is perfect for the particular. Wouldn’t it be great to see all of the world changing, genius ideas that had been sketched on a napkin? With the Napkin Sketchbook from baumkuchen you can be always prepared for inspiration to strike. Its designer wanted to allow creative people the freedom that a blank napkin gives but in a portable, stylish way. 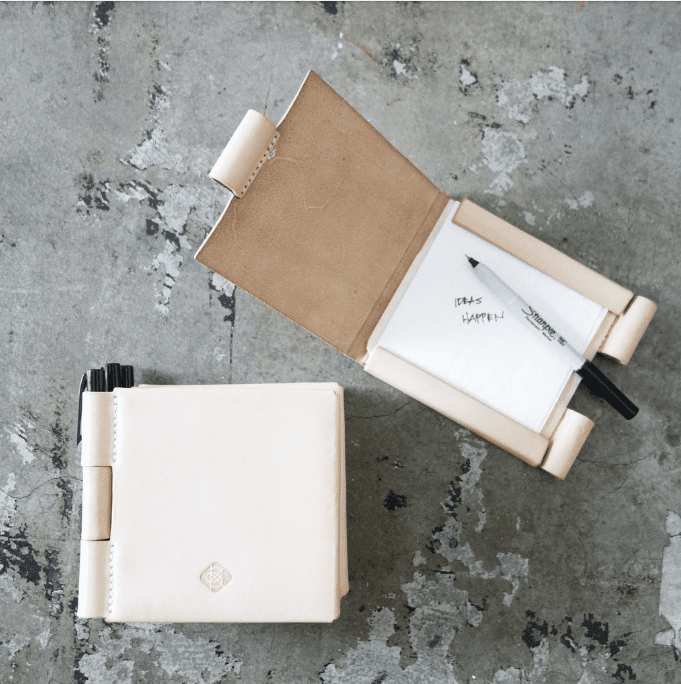 In a beautiful leather case, complete with Sharpie and 10 napkins, this stylish alternative to the sketchbook is perfect for capturing ideas and storing your napkin sketches in one place. This high-quality product is designed with great attention to detail, from the pen holder to the laser etched design. The Cable Drop from Bluelounge has been popping up in offices and studios all over the place. These handy multipurpose cable clips can be used on your desk, under ledges and shelves or on the wall to keep cables in place so you know where they are when you need them. Available in a range of different colours you can choose which best suits your office and whether you want them to be hidden or not. Perfect for keeping your desk tidy, and organising different chargers and cables, they’re self-adhesive too. This stylish smartphone projector is a great gadget with handy features and a modern design. It can project on to any flat surface with a 50-99cm screen size and doesn’t need any batteries or power. We’ve all been there when a projector breaks, and a presentation grinds to an uncomfortable halt, but that can be avoided with this nifty gadget. It’s good for film nights, showing photos or video chat too. This smartphone projector has a pull out stand, slots for headphones and a grippy silicone base too. The legendary Japanese architect Shigaru Ban has designed the perfect pen for architects. Winner of the 2009 Good Design Award, this working ballpoint pen is also a fully functional architect’s scale. Designed to be comfortable to use, it has a unique triangular shape and is crafted in high-quality aluminium. With both metric and imperial measures, the scale features a twist mechanism, so it’s easily adjustable for whatever project you have. Inspired by some of the most iconic buildings, the La City desk organiser by Seletti is a super stylish alternative for storing your office supplies. 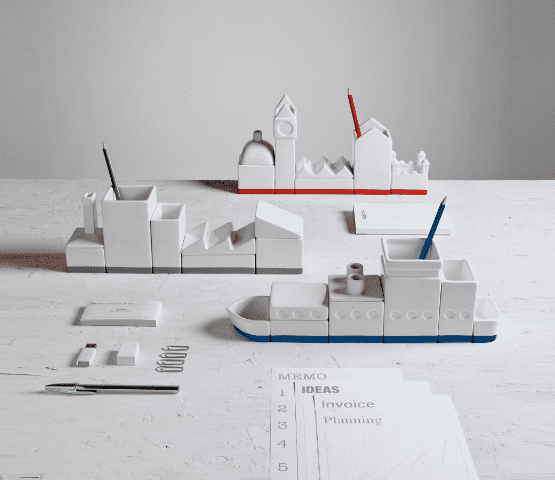 With five different parts that can be moved about and arranged, including some with lids, this desk tidy is the perfect gift for any architect. Made with white porcelain and in a minimalist style, this will be a welcome addition to any desk. The credit card power bank is the perfect solution to running low on battery and needed to charge your phone on the go. Its compact design means it fits easily into a credit card slot in your wallet or purse. It’s a 2000 mAh power bank and can be charged up via USB. Compatible with all smartphones and devices, this handy credit card power bank is a great gadget to have with you. 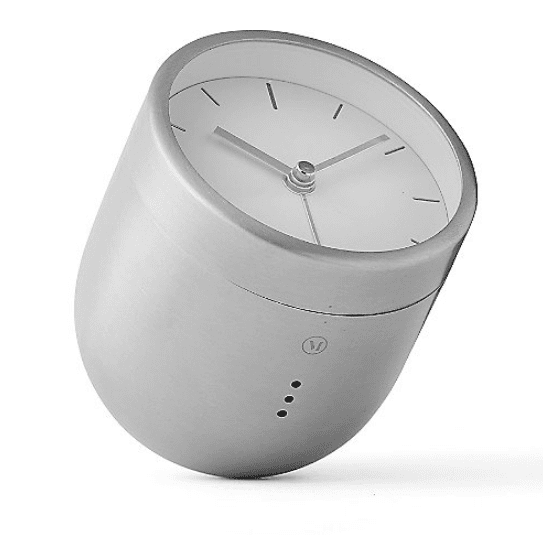 Designed by Norm Architects, the Tumbler Alarm Clock is a unique take on the alarm clock. It has a specially weighted and rounded bottom which allows it to wobble and tilt. In order to turn off the alarm, you have to turn it upside down to stop it. With no buttons and a simple, modern design this clever alarm clock is perfect for any architect’s bedside table. The MiniSun A3 Ultra Slim LED Light Pad is a modern and lightweight update to the traditional light box. With 356 lumens and the latest LED technology, this light pad is perfect for drawing, tracing, stencilling and photo work. At only 8mm thick, with ruler guides and document clips, this light pad is a great tool for any architect. If you’re looking to make a statement in your office, then this Anglepoise floor lamp in Paul Smith colours is a great lighting solution. Bringing together a classic design and bold colours, we love this modernist twist on a classic. Though it’s not exactly budget friendly, this giant lamp is perfect for those who are passionate about great design. The Cube Portable Colour Digitiser is an awesome gadget that designers and architects have been excited about since its launch. This little white box allows you to capture any colour digitally so you can reference it. It works on any surface and also measures ambient temperature and light. With the free Cube app and a variety of colour libraries available, you can pick the perfect paint colour for your project. This quirky brown paper bag insulated lunch bag is a fun way to take your lunch to work. It’s designed to look like a simple paper lunch bag, but it’s much more than that. It’s got a magnetic fastening to keep it sealed and an insulating design, meaning no more warm or soggy sandwiches. It can also be personalised with a pen so you can get creative too.